Last Thursday, we had some of the best rainfall we’ve had in some time. Also, it was a cold storm, so there was much snow on the mountains. 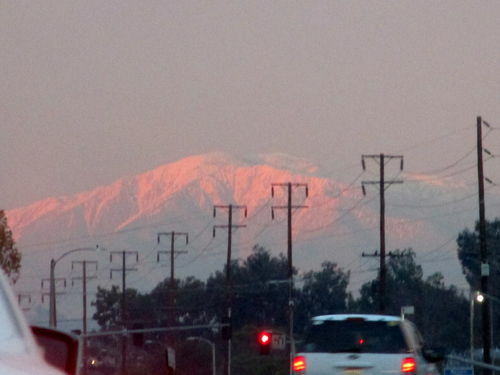 It’s been, actually, some years since I’ve seen this much snow on the South Slope of the San Gabriel Mountains. Mount Baldy – pictured here – is the one we can almost always count on for having snow visible from the South, being the tallest in the range at 10064 feet. But, this year, after last Thursday, many of the lower peaks are also dressed for a wedding. Okay. Now that I’ve got that off my chest, show-and-tell time. For, oh, I don’t know, a couple years now, I’ve been thinking about embarking on a journey of pen making. A lack of knowledge. About where to begin. 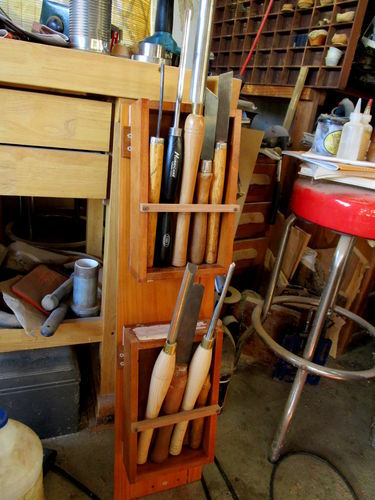 What do I need to procure by way of tools and equipment? I know there are quite a few things needed, and I’ve always seen it as a thing that I need to approach gently. You know. A tool here; a mandrel there; A pen press here; A bag of blanks there; Pen kits. Approached gently, as I said, so’s not to cause too great a shock to my bank account. But, where to begin? Yes-turd-day. Yesterday STUNK. It SUCKED. IT WAS A VERY BAD DAY, IN MY LINE OF WORK. The things that happened yesterday, the way things went for me, were not entirely out of the ordinary. The part that sent me over the edge was the way I was reacting to the things that were going on. I haven’t taken a “vacation” in many, many years. You know? Where you drop the mundane inanity of life and go on a trip or something? I haven’t done so in so long because, quite frankly, this how-I-was-reacting-to-events situation is nothing new. I haven’t gone anywhere, by way of getting away from it all, since the 1980s, and, here’s why: Wherever I go; there I am. It’s me – my reactive personality – the VIMH (the real one, not the funny one you know), that I want to get away from. I can’t do that. Neither can you. Some of us, however, are a little more vexed by all this than most. I’m one of those. Now that you know a little more about me than, perhaps, you desired, I’ll go on with how this pen came about. About five hours into my day, yesterday, I was sitting in Costa Mesa, steaming away. I pulled down the visor in my car and looked in the mirror. How far away is Woodcraft? I looked it up on Waze. Less than two miles. I pointed my snoot in that direction. I may not be able to master, at this stage in my life, one of the real eye-catching art forms I admire so – the money makers like carving or marquetry. But this thing that I’ve “thought about getting into” for a couple years? This, this pen making? That, I can do something about. Two fellas proceeded to see to it that I had everything I needed to make a pen. You know what? It wasn’t cheap. I needed EVERYTHING, short of a lathe, which, as I’m sure you know, I already sent my bank account into conniptions over, earlier this year. So, this, my Beloved Buddies, is my first, my “adequate” first attempt, my nearly $350 pen. Now, one needs room for making pens, or, really, beginning anything new. 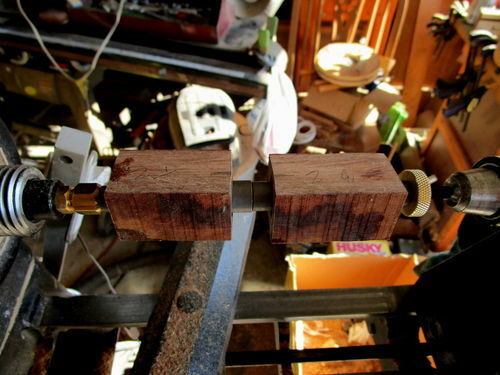 In this case, I needed to get to my drill press and bandsaw (I need, eventually, new, big-boy, no-benchtop style in that area, too – the pieces o’ junk I have made the initial stages of this project a wretched affair), and, I needed the top of my workbench, or, at least, some of it. 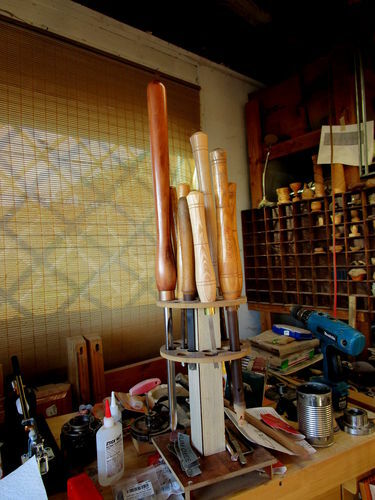 So, beginning last night, after dinner, I made a new way to keep my turning tools, which have been kinda piled on my workbench for months. I slapped these together last night and this morning (it was too late, last night, to run the table saw). It’s not much. But it works. And, it’s portable. And, together with my old tool holder. 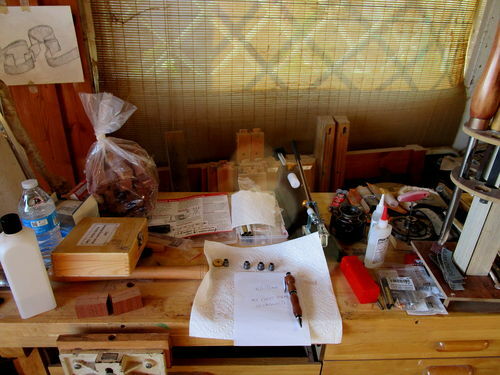 And, now, there’s room on my workbench for doing the preliminaries and assembly of pens. So, mebbees, going forward, if I can get good enough at this, just mebbees, my sole source of revenue can cease being the sole source. I said, “a few,” didn’t I? I was too involved and engrossed to be the industrious photographer you’re accustomed to. Here are two shots of the fifth coat of Hampshire Sheen, getting settled. 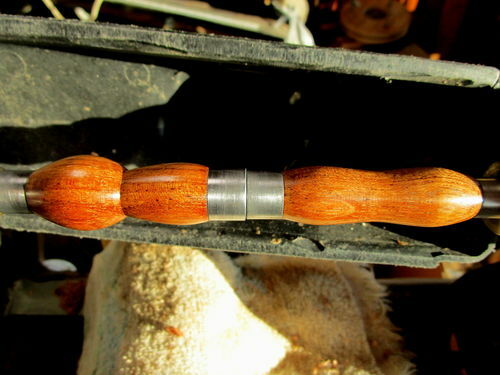 I wanted you to see the profundity of these shots, as I saw it, after buffing. I started finishing this with CA, for that “glassy, plastic look. 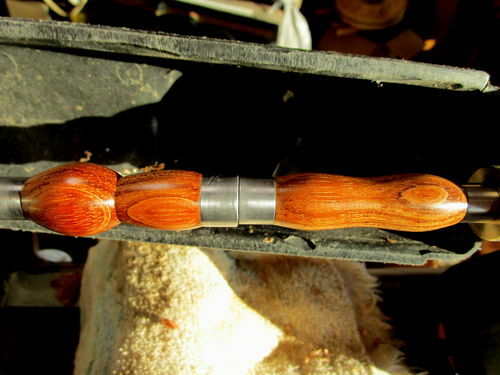 I wasn’t pleased with how it was going, so I sanded it back down and applied Yorkshire Grit and Hampshire Sheen. It’s a finish that won’t hold up too well, but, then, this is a pen that doesn’t intend to be used, beyond the words you see in the photos. I hope I haven’t said too much. Thank you. And, I truly apologize. Nice job Mark. I’ve not turned a pen in 2.5 years. So much for moving and not finding anything. Great first pen Mark. The progress shots are interesting. I have never turned a pen yet but it would be great to try some day. In the mean time, Bic is in the house. alright you finally popped the cherry buddy-lol.i still cant believe you fretted so long about turning a pen being the skil level turner you are,see it didnt hurt.pretty good effort for a newbie!your gonna be sorry though ,pens are like potato chips,you cant turn just one-lol. Nice first pen! I see the guys at Woodcraft spared no expense in getting you stet up. 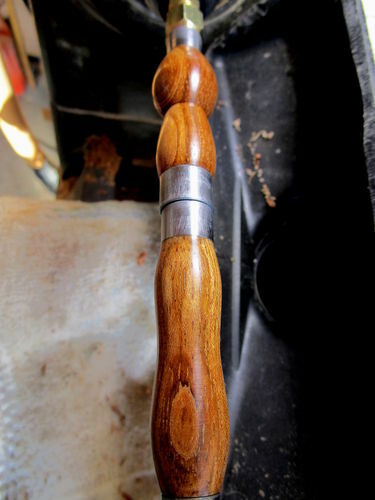 I find turning pens is very rewarding but I have yet to master a good finish and it seems like everytime I make one it requires a new set of bushings and a different size drill bit. Nice pen, Mark. Glad you got settled down to business on one! I’ve only made one at school but now you me interested The market is good too! Nice curves. and interesting story, take a trip way up north to get a new perspective, loved to have you come and visit. 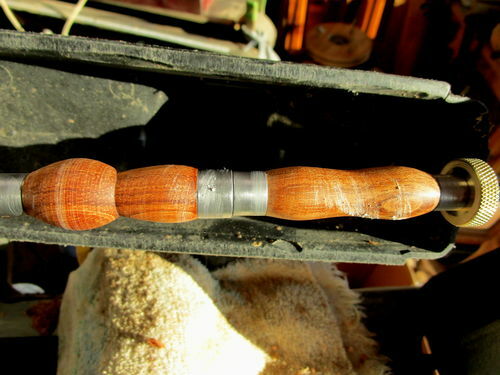 I have though of making pens when I was thinking about a way to make things to sell. Here we don’t have people with the money, to buy them and I don’t need the money anyway. I like to design and make new thing. Best of luck with your new adventure. I still like your eccentric goblets, they where radical. Lew, as I said, I tried the standard CA, plastic look, and, I’ll probably explore that further. When I re-did it with the YG and HS, I found a very pleasing, soft, warm feel to the pen. 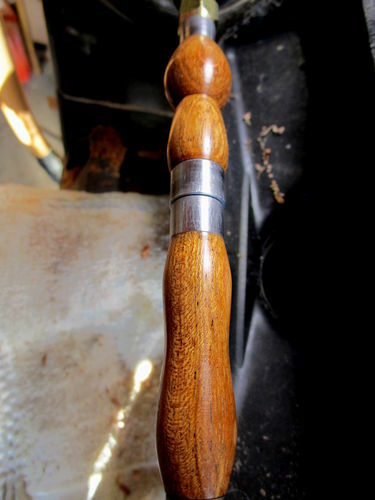 One of the Masters I’ve been paying attention to says he gets the same from WOP, which is every bit as durable as CA, maybe moreso, inasmuch as you can drop a pen finished in Poly and the finish won’t shatter like CA probably will. 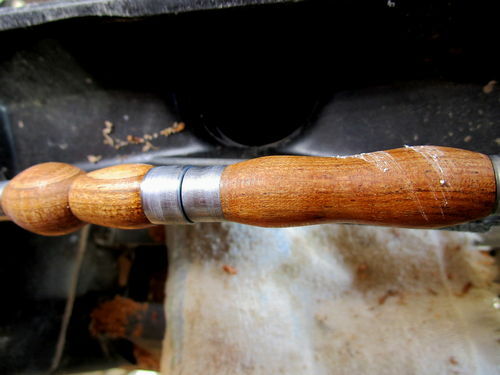 And,about those bushings: I’ve watched a lot of videos of penmaking over the last couple years, and a thing that stands out in my memory is the advice to keep the tools and abrasives away from the bushings. As to sizes: As far as I know, 7mm is the most common, 10mm for Cigar pens, like this one, and some of the specialty pens go to 12mm. A funny note about precision: Not here. See the new post that’s coming in a few minutes. Nice work! Pens on steroids. Great scenery, great pen & great blog Mark. Great looking pen, it looks like it would be very comfortable to hold, and you still managed a creative flourish in that bulbous top. Great story to go with it also. Now I must go look at pen #2.